Find out about the beautifully decorated oxcarts of Costa Rica. Discover the origins of Russian "matryoshka" dolls and see how they're made. See spectacular traditional costumes from Russia and surrounding countries. Explore an elaborate altar used in Day of the Dead celebrations. See examples of folk art in Britain, including a military quilt. 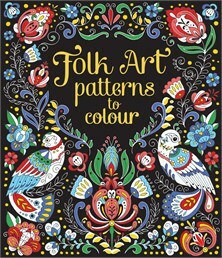 A lovely colouring book of the patterns used in folk art around the world, from floral designs on Hungarian dancers’ costumes and Russian Matryoshka dolls, to geometric patterns on Portuguese ceramics and ornate Day of the Dead sugar skulls. Includes snippets of information about the patterns, and links to websites with more examples of folk art. Each page is delightful and if you would like to complete at least one colouring book in your collection and the others just feel like a mammoth task, this would be a good one.